projectile is recommended for a 1-1/2" (38mm) hose. 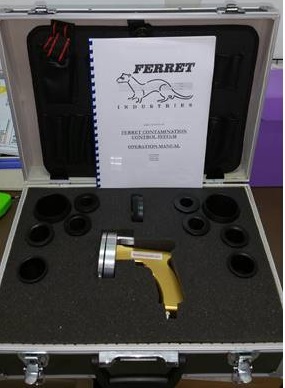 All Ferret projectiles ensures a quality product that is capable of achieving ISO-4406-99 and ISO-4405 cleanliness levels when our assembly procedures are followed. be used for product purging. Cleaning of fuel lines, brake lines prior to assembly after servicing of components. Cleaning of Airconditioning and power-steering lines prior to replacement. Using Polyshot tube cleaning projectiles during product changeover and cleaning. This reduces product waste whilst at the same time reducing or eliminating solvents or detergents, used in cleaning the lines. Speeds up the changeover time, and increases production. Eliminates minute particles in copper tubes, coolant lines that affect system performance. Removes most scaling in steam pipes for maintenance servicing. Using Ferret Polyshot Foam Projectiles will speed the cleaning of conveyance pipes. and aid in the cleaning of product from injection moulding lines. Eliminates contamination that reduces heat transfer resulting in low level performance.